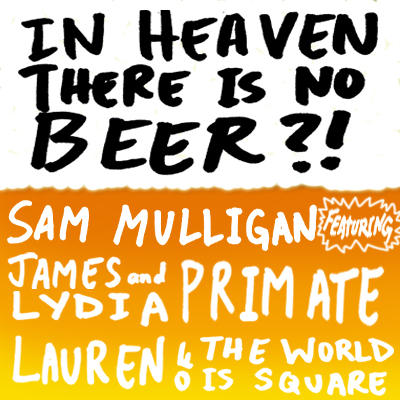 Here's a new song I recorded with some help from my friends James and Lydia Primate from Br1ght Pr1mate, and Lauren of The World Is Square! I guess it's a little misleading to say it's a new song because it is a very old song - a cover of the polka standard, "In Heaven There Is No Beer", one of my favorite polkas! Lauren played the ukulele, and James and Lydia contributed the background vocals and mixed it all so it sounds super perfect. Superfect! I forgot exactly how this came to be, but it started with some people (Taters Hood) on facebook talking about how there should be Chip-polka in existence. Of course, this gave me flashbacks of when I was a college radio DJ at WRUV in Burlington and hosted a polka radio show. Years later I find myself hosting a chip music radio show and playing goofy music with a gameboy. The result, chip music and polka must now fuse to become, "CHIPOLKA". Enough yapping, time for toe-tappin'! I am sorry.